Genevieve Delatour: Years of Mexican cooking have disfigured me. 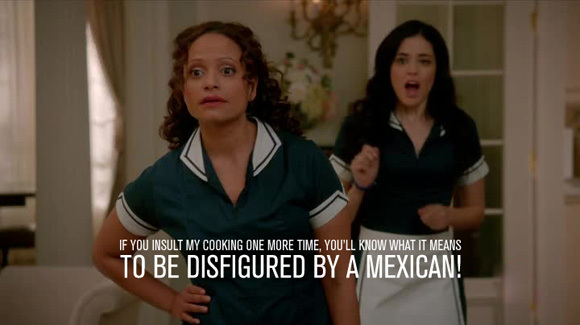 Zoila Del Barrio: If you insult my cooking one more time, you’ll know what it means to be disfigured by a Mexican! I’ve laughed at least ten times reading and typing this quote. I’m sure both you and I are watching Devious Maids for completely different reasons. Russian be gone! xD I’ve spent the last week watching Bollywood films! First thoughts? I’m loving it. It cost me a bit to get accustomed to the 3hr running time of most films, but I think I don’t care… that much any longer. Fluff musical numbers are still fluffs, and that’s what irks me the most… but at least they’re good for exercising. I love the complicated melodrama they get into. I can totally get why people in Peru are into Bollywood films and numbers. When Brown Eyed Girls released the name of the songs, I was immediately drawn to Kill Bill, because DUH! It’s Kill Bill, dude. Now I’m so psyched that THAT song is going to be their comeback single. I really don’t know and haven’t looked into who is directing this, but it could be either Hwang Soo Ah or Zany Bros, haven’t decided yet. It could be either of those two due to the style of the MV. Now, the question is… should I buy the CD or wait for the repackage? Though, I must admit that both versions of Sixth Sense were SO pretty. I look young. My older cousins, who are just a bit older than JeA is, still see me and still tap me on the head. I still get carded. When traveling or meeting new people in general they always ask me about school… and I don’t mean it like asking about university. They ask me about high school or wonder what I’m choosing to study at university. I graduated from high school ten years ago (gosh!). I usually look at people on movies or tv shows, watch their music videos,  and I think people… look like contemporaries of mine. When I google them, however, I’m surprised some of them are five or ten years younger than me. It’s crazy. So because I tend to look at myself and think of my age, my expectation of how young people look is skewed. Strangely enough, JeA still surprises me. Starting out, I thought she was older than she is. Mid-thirties instead of early. As the years go by, she seems to be getting younger and younger, though. In this promo photo for the Brown Eyed Girls comeback (YAY! Comeback! ), JeA looks like she’s 16. It’s nuts. 14 if you consider the giant teddy ages her down. And the pout makes her maybe a year younger than that. Also, I’m psyched about the new album. I’m lukewarm on the Recipe single, though. A lot of people describe Chulpan Khamatova having a deep raspy voice, and I usually disagreed with them because I find her acting voice quite high-pitched… except on The Event, which no one has watched, and I think that’s a play. So maybe… she used her voice differently when she acts on stage and when she’s on set? She definitely has two voices, as you can see from this video. Khamatova had recently received some award from the Russian government for her work as an actress, alongside another actor and a whole bunch of other people. Sorry I’m not helpful looking for links or exact words, but I want to be quick about it. You know who else has different speaking voices depending on whether she’s giving a sponsor interview, making a commercial, regular talking in a serious talk show or just talking about acting? Yu Aoi.